I hope you’re enjoying the warmer weather and the arrival of May flowers. We have some exciting activities coming up in the 24th Senatorial District. I’ve outlined them below, along with some other important items. 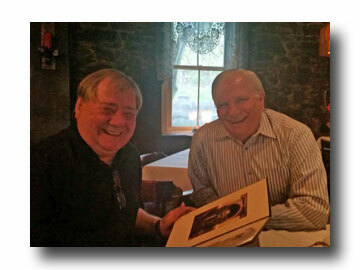 This edition of The Mensch Report features my tour and visit of the Limerick Power Plant in Montgomery County. The Limerick Generating Station is a safe and valuable resource for the surrounding community. In addition to the electric reliability and environmental benefits that the plant provides, Limerick Generating Station provides direct and indirect economic benefits to its host community and the state, including over $200 million in economic contributions annually to Pennsylvania. Senator Mensch presented a well-deserved citation to Mr. Eric Wade in recognition and celebration of The Inn at Maple Grove's 30 years of operation. Planning a road trip, field trip or weekend getaway? The Pennsylvania Tourism Office is available to help you plan a trip to Pennsylvania's landmarks, parks, museums, festivals, sporting events, shopping locations, wineries and more. Also, this resource assists individuals, groups, and families who need to find a place to stay during multi-day trips. You can request a vacation guide to learn about the various options that are available to you. You can also stop by any of my district offices to request a Pennsylvania map to assist you on your travels. 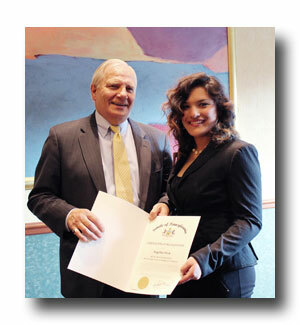 Senator Mensch was honored to recognize Angelina Shirak, from Montgomery County Community College, for becoming a member of the 2015 All-PA Academic Team for CC's! For those of you who enjoy the outdoors, I encourage you to stop by one of my district offices and pick up a copy of the Pennsylvania Camping Guide. Whether your pleasure is fishing or hunting, boating or swimming, snowmobiling or skiing, or any other outdoor activity, you will find it in Pennsylvania. The Pennsylvania Camping Guide provides a directory that is divided into six regions which includes campground names, facilities available, driving directions and more. 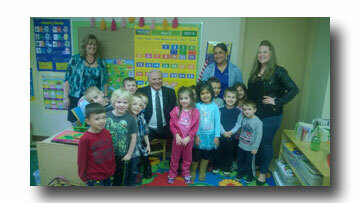 Senator Mensch and Representative Tom Quigley enjoyed meeting the 2nd grade students from Wyndcroft School in Pottstown. Do you enjoy the outdoors? Do you want to learn more about different outdoor/sportsman programs, activities, and resources available to you and your family? 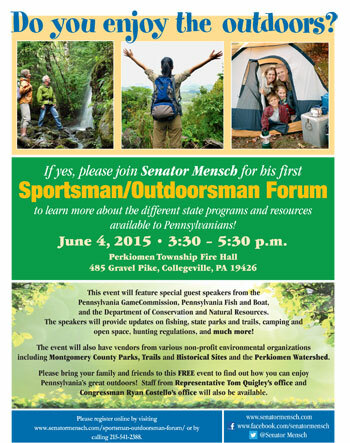 If yes, please join me for my first Sportsman/Outdoorsman Forum June 4 at the Perkiomen Township Fire Hall to learn more about the different state programs and resources available to Pennsylvanians! This event will feature special guest speakers to provide updates on fishing, state parks and trails, camping and open space, hunting regulations, and much more. The event will also have vendors from various non-profit environmental organizations. Please bring your family and friends to this FREE forum to find out how you can enjoy Pennsylvania’s great outdoors! You can register for the event online here or call 215-541-2388. Do you ever feel “ripped off” in the marketplace? Do you understand Pennsylvania’s amusing and confusing sales tax application? Have you noticed that the packages are shrinking the amount of product we get for the price you pay? 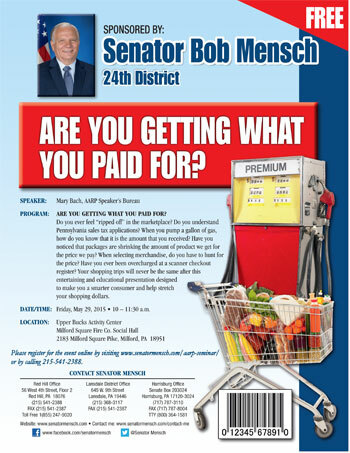 Your shopping trips will never be the same after you join me May 29 at the Milford Fire Company Social Hall for an entertaining and educational presentation designed to make you a smarter consumer and help stretch your shopping dollars. This event features special guest speaker Mary Bach from AARP Consumer Issues Task Force. Recently, 23 pieces of legislation were enacted, changing how Pennsylvania responds to child abuse. These changes significantly impact the reporting, investigation, assessment, prosecution and judicial handling of child abuse and neglect cases. 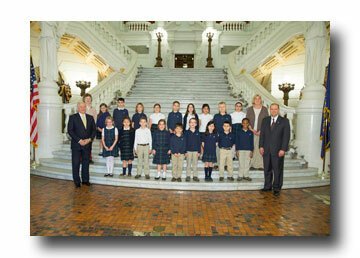 The Keeping Kids Safe website, KeepKidsSafe.pa.gov, is designed to serve as the hub for information related to critical components impacting child protection including a link for mandated reporters to make reports of suspected child abuse electronically, training on child abuse recognition and reporting, information related to clearances and general information related to child protection. Senator Mensch was honored to join Lisa Boscola and recognize the students of the 2015 All-PA Academic Team. 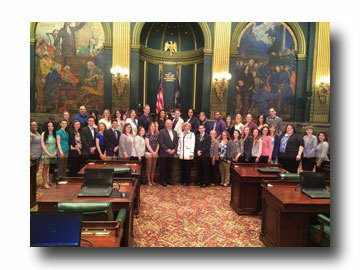 There are 44 students who are a part of the All-PA Academic Team. This is a friendly reminder that my district office has moved from Main Street in Pennsburg to the second floor of the Red Hill Borough building in Red Hill. Please note the telephone and fax numbers are the same. The office is staffed Monday through Friday from 9 a.m. to 4:30 p.m. Please stop on by if you have a chance. We’d love to see you. 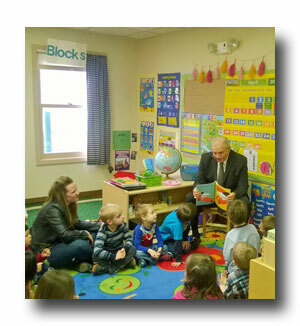 Senator Mensch greatly enjoyed reading to preschoolers at Life Span School and Day Care in Quakertown!